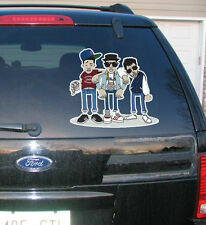 You get the following 1 Sticker 8" x 2 1/2". Beastie Boys . Condition is Acceptable. Dispatched with Royal Mail 1st Class Large Letter. THE BEATLES. PRETTY MUSH THE SONGS FROM "BEATLES FOR SALE" ALBUM. BEATLES ITEM. LOVELY GIFT FOR A BEATLES FAN. SHEET MUSIC. SOUVENIR SONG ALBUM. for a music sheet book of this age. 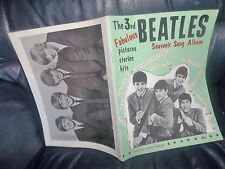 A FOOT NOTE FOR LESS EXPERIENCED or NEW BEATLES COLLECTORS;. Used but very good condition pre worn Marilyn Manson T Shirt. Size ladies large. Offiicial merchandise. PayPal or cash on collection. Beastie Boys - To the 5 Boroughs (2004). 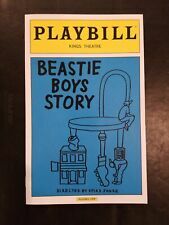 Beastie Boys book . fantastic auto biography going from there Punk roots up to present. Retails £30 . This is the cheapest on E- bay. Excellent condition. THE BEATLES. PRETTY MUSH THE SONGS FROM "BEATLES FOR SALE" ALBUM. BEATLES ITEM. (slight crease around the centre of the front cover but that is pretty much it! SHEET MUSIC. Your chance to OWN the official and ORIGINAL. ). Generally speaking, Mark created 150-200 proof sheets for each show. This is about 10% of the number of handbills created for the Bill Graham & Family Dog shows in the late 60's. BEASTIE BOYS Hello Nasty. This wonderful original tour shirt was from the Beastie Boys Hello Nasty World Tour of 1999. Know that the original shirts were issued by Lee and were 100% Cotton. If you see them by Glidan they’re certainly a reprint bought at Walmart, Kohl’s or the like! Shoes are always authentic. I will do my best to make you happy! This is an original 1995 Beastie Boys concert shirt from the Quadrophonic Stereo Sound Tour in support of the Ill Communications LP. The model in the photo is 6'1" and about 185 lbs. for reference. It appears to be dated 2001. This is a date specific sweatshirt that dates back to the late 1980s for a campus production in Buffalo, NY. This shirt WAS NOT SOLD TO THE PUBLIC and only give to the local crew on the tour The item is made by Hanes, 100% cotton, adult size Extra Large, 22” pit to pit, and 28“ from the top of the collar to the bottom of the hem in the front. It is part of a series of "Rock Icons" I am creating. Bright, vivid colors and deep, deep blacks - Lots of details (see photos). I created these collages out of my LOVE for the artists and their music. 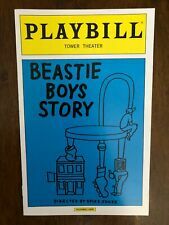 Beastie Boys Hello Nasty 1998 Promotional Hanging Mobile Sealed Perfect. Second photo is my own copy which i have broken down. Winning copy is sealed. This is a classic design and graphics. 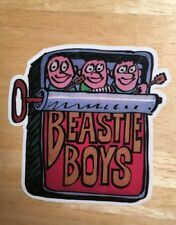 Any BEASTIE BOYS fan would like this find. Made of a satin type material. Artist: Rhys Cooper. Signed by artist: No. Excellent condition with no holes or odors. See all pictures. Beastie Boys picture 12” disc. Circa 1987. Rare unofficial Release. Limited edition. 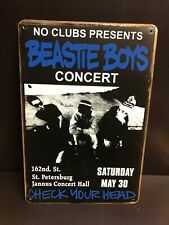 BEASTIE BOYS Australian Tour 1999 CONCERT POSTER Signed & Numbered JACENKO Mint! This is an original print. Great color with no fading. See pictures for more details. All of our antiques or collectibles will, hopefully, be exactly what you were looking for. Every item is hand picked and selected by our staff. This is a rare printers proof which is hand signed by the artist Justin Hampton & is marked P/P. Only a handful of these proofs were created. These are printed before the numbered edition is printed to check the colors. It is not a reprint. There is a fold mark from storage, and light edge wear, but it remains in fantastic shape. You can buy a cheap reproduction, or you can own a piece of History, it's that simple! This copy has no tack-holes or scotch tape marks and is in Excellent condition. The concert was at JFK Stadium on June 13 & 14, 1998. The item is 7" x 9 1/2". T SHIRT IS LIKE NEW, THERE IS LITTLE TO NO WEAR OF ANYKIND. SHOULDER TO SHOULDER 16. TOP TO BOTTOM 24.5. The item is 100% cotton, adult size Extra Large, 22” pit to pit, and 25“ from the top of the collar to the bottom of the hem in the front. Nothing is printed on the back. Also included, is a 1 3/4" round button from 1987.